Our Turret presses can operate at near progressive speed, switch cartridges in seconds, and with experienced hands, can reload up to 250 rounds an hour. All presses feature solid steel linkage. All Turret Presses are equipped with the Lee Lever Prime System with large and small primer arms. Features lift out convenience, and works in conjunction with the Lee Safety Prime. Power and strength to spare, plus unequalled convenience. 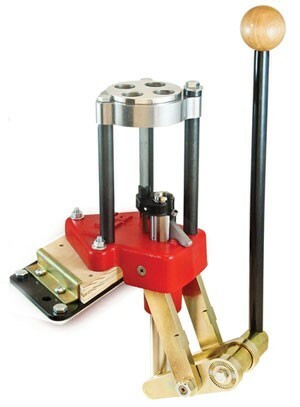 This Lee Turret Press really shines when loading large quantities of handgun ammunition. The auto index feature on the 4 Hole Turret Press is capable of loading cartridges with an overall length of 2.313" or less. Anything longer would require the turret to be manually advanced.